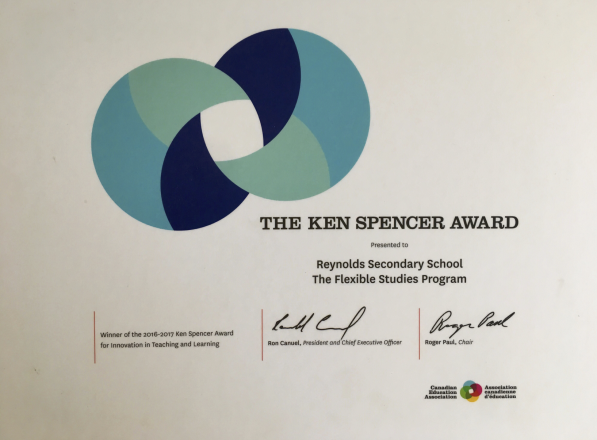 Nationally recognized by the Canadian Education Association for innovation in teaching and learning, the Flexible Studies Program is designed for students interested in a structured inquiry-based approach to education, where students engage with their peers, teachers, community and environment as they pursue their personal academic excellence. The Flexible Studies Program uses the acronym VOICES to summarize our educational philosophy. 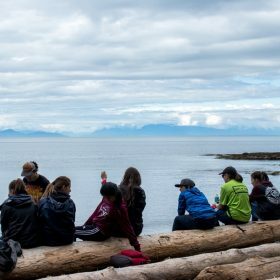 We believe that providing opportunities for students to engage with content in meaningful and relevant ways, to explore their own ideas and questions, and to share all of this with our community, will result in students who are highly engaged in their educational experience. A Flexible Studies Program student is someone who is willing to challenge themselves; willing to learn from their peers; willing to work in groups and as an individual, sometimes without a teacher over their shoulder; willing to start over; cares more about the process than the grade; is willing to ask questions and seek help when needed; is willing to take risks when supported by teachers and peers; wants to be curious and has a sense of wonder. The Flexible Studies Program believes in the pursuit of personal academic excellence and providing opportunities to develop leadership qualities, supporting this at a personal level for each of our students. The teachers in the Flexible Studies Program will support our students as they pursue the many post-secondary options available to them. Please visit the program summary page for more information about the Flexible Studies Program, including the full information guide in pdf format. Admission into the Flexible Studies Program is by application. Applications are due to Reynolds Secondary by Friday January 26, 2018 at 1:00 p.m.
To apply to the Flexible Studies Program for the 2019/2020 school year, please complete and submit the online Flex Application form or complete the paper Flex Application 2019 and bring it into the school. You can also visit our website at www.flexiblestudies.com to see what is currently happening and/or our blog at www.flexiblestudies.blogspot.ca to learn more about educational ideas that get us thinking.